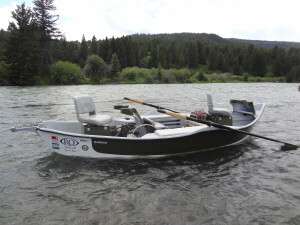 Fishing from a drift boat is the most efficient way to experience the big rivers of Montana and can provide opportunities to reach remote parts of the river not accessible by foot. 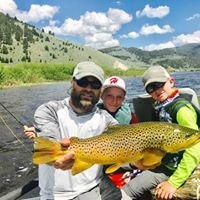 Drift boat fishing allows anglers to cover up to twelve miles of river in a day, and thus expanding opportunity for catching fish in a diverse array of situations. In one day you can experience dry flies, nymphing and streamers. Our guides are experienced boat operators, and are experienced in teaching effective drift boat fishing techniques. The rivers we offer our float trips on are the Missouri, Yellowstone, Madison and Big Horn Rivers. We use the very best drift boats in the industry today. Ro Drift Boats are made right here in Bozeman, Mt and are very comfortable and rock solid. We can accommodate your trip to your needs. Let us know if you would like a nice break with a shore lunch or you don’t want to stop one second and have our guides hand feed you! We guarantee we have some of the hardest working guides you will ever meet. Our fly fishing trips can be based out of Helena, Bozeman, Billings, Great Falls, Big Sky, Fort Smith or Ennis, MT.